Inspiration can strike at any moment. For me, it is like a lover that I have to woo. I bring it gifts of coffee, wine, and sometimes, flowers. I insist that if I buy this beautiful bouquet I see before me, that I will be inspired to clean my house. In this way, inspiration is fleeting and plays hard to get. Just when I have lost all hope, it strikes and I am inspired by the oddest things. For example, I have a date with a lamp post in Washington D.C. Surrounded by the largest collection of art and beauty, antiquities stolen and gifted, I am struck by inspiration. 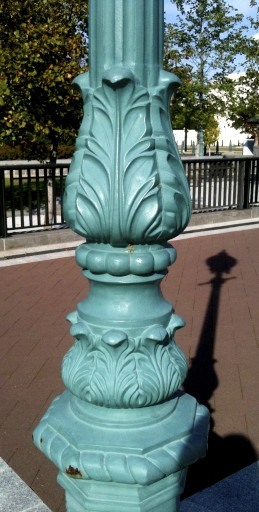 Not by the obvious, the museums or their surroundings, but by this turquoise lamp post. I seek it out and want to admire it for how unusual it seems in this environment. Another moment of inspiration came in mid-winter when I was walking past a spot that was ordinary to me. A spot I had been by 100 times before and to be honest, had never really noticed. 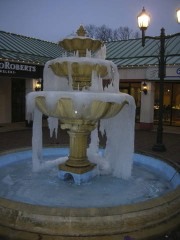 This time, I stopped and stared at the fountain that was frozen in place. The cascades of water had stopped in mid-air, suspended by their beauty. They were defying gravity. I was witnessing nature and she had put her stamp upon this urban landscape. Inspiration can hover over me in the early morning. When I am halfway between the dreams I had and the day I must face. I am in touch with my subconscious at this time. I am not really aware and not yet jolted awake by the dreaded alarm. Yet my brain is rested and working to catch a moment of inspiration. To whisper the secrets of how I can seek it out. If I am lucky, I can seize it. The purpose of this page is to lure you outside. To view the places you may not have looked at before. The places you may not have noticed before. To find something beautiful among the ordinary. To help you notice something that can inspire you. Inspiration is fleeting and you must treasure it when it comes. © copyright 2012 Mariam d’Eustachio All rights reserved. Wow- great writing and really made me think about what helps to inspire me!